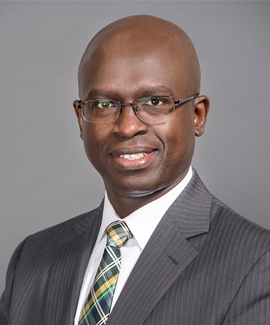 Martin Mbugua is Skidmore's first vice president for communications and marketing, filling a new post at the college. Following a national search, Mbugua was appointed effective Nov. 1. Mbugua brings more than 20 years of experience in journalism and higher education, most recently as assistant vice president for content and communications at Carnegie Mellon University, where he led online news, media relations, and other communications programs, and as director of media relations at Princeton University before that. His reporting and editing included the New York Daily News and Queens Chronicle, as well as the Daily Nation and Standard of Nairobi, Kenya. He holds an MBA from the University of Delaware. He earned a bachelor’s in journalism and a master's in government, politics and international relations, both from St. John's University in New York City. At Skidmore, leading a staff of 20 in the Office of Communications and Marketing, he says he is eager to "enhance the sterling reputation and visibility of one of the finest liberal arts colleges in the nation."